Bobbie workin’ it in a dancing gherkin skit? 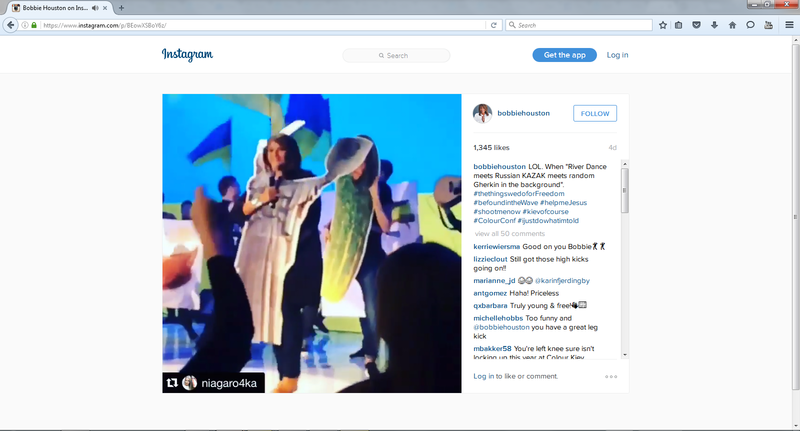 Home › Hillsong › Bobbie workin’ it in a dancing gherkin skit? What do you get when you combine a prophet with a dancing gherkin? A really bad joke. Bobbie Houston, a divine Prophet of the Hillsong movement “awakened a new era and created a shift on the earth” through her Sisterhood movement. This all happened because she received a “God Whisper” in 1996. Apart of this Sisterhood movement is Prophet Bobbie’s annual Colour Conference. So how does Prophet Bobbie and the Sisterhood glorify God in their Colour Conference? Well… This is from Prophet Bobbie Houston’s Instagram. Is this worship? How is this glorifying God? This is simply advertising for goats to come along and enjoy a circus event. This nonsense brings glory to Prophet Bobbie Houston but shame to the name of Jesus Christ. Sadly, goats defend the trash heap and spit at God’s sheep. The COLOUR Conference is much more than an annual event that gathers thousands of women across four major cities and continents. It is an ever growing global movement of everyday women, seeking to create a stance for justice, change and influence. It is a story of “divine grace” and it’s ability to find its way into the human heart and weave the story of God’s great love into the lives of those seeking a better world. COLOUR seeks to “gather, equip and mobilize” women of all age, background and culture in the belief that together we can and will make the world a better place. COLOUR is about you and your world. It is humanitarian at it’s core and our desire as 21st century women, is to be strategically positioned to contribute and bring solution to pressing needs that are both local and global. The conference is continually creating pathways for women to raise awareness and mobilize response. Source: Hillsong, http://hillsong.com/colour/, Accessed 29/05/2014. I wonder how many Millions $$$ have been wastefully paid to this dancing clown over the years?